just a little update of the mounting process: BR Mark 1 TSO and BC. after a number of experiemts, I finally achieved something I dare to show here. 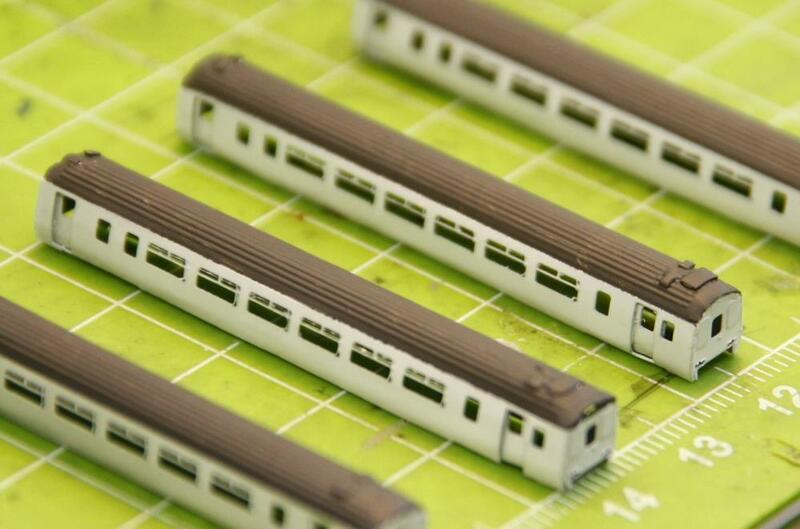 Actually, I can't wait to show it My first batch of Class 156 cars gets painted. First, I sprayed the mounted cars with Tamiya primer. Three thin layers. Second, I painted the roofs (after having covered the sides) in gray. Especially the front sections are tricky. And then .... ta ta ... decals attached to the sides do the job. They do actually two jobs, coloring and window glasses! It needs some practice to place the things exactly where they belong. But I think the image shows: this technique is not the worst. It is applicable to a wide range of models. The decals are printed with my ink jet, so it is very simple to generate different coloring schemes etc. I will show more images once I have treated all sides and put the cars on wheels. Oh I love your nickel silver stuff Kupzinger and I'm not surprised you can't wait to show your fantastic paint job. 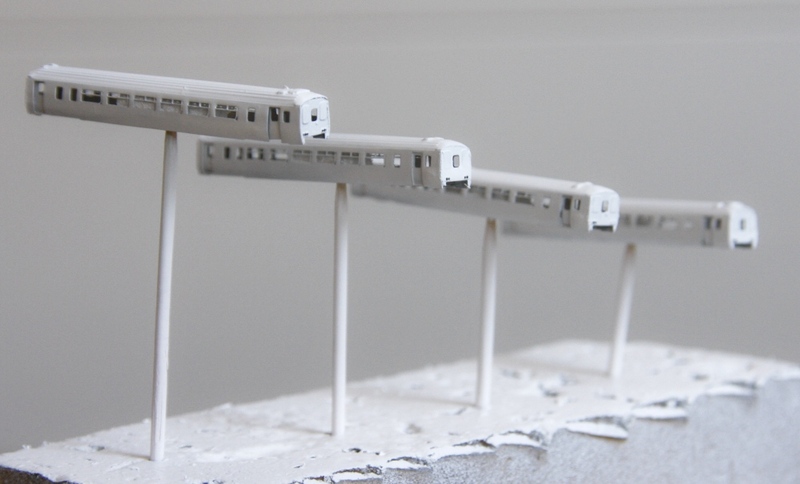 To achieve that at T gauge is amazing. 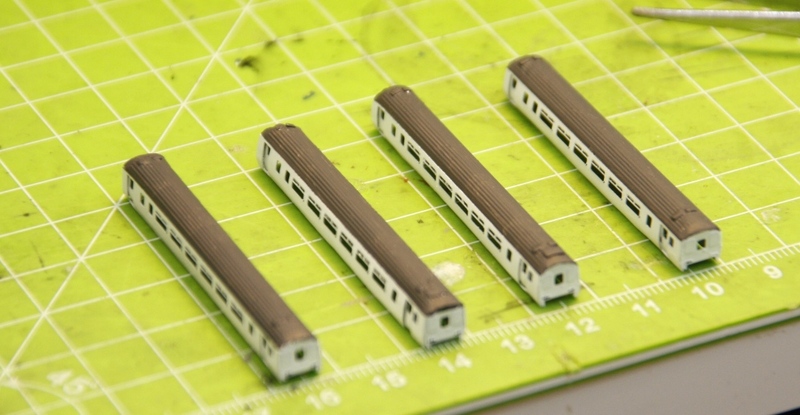 Close up photos are usually a killer for small scale stuff, even in O gauge, showing up all the faults. 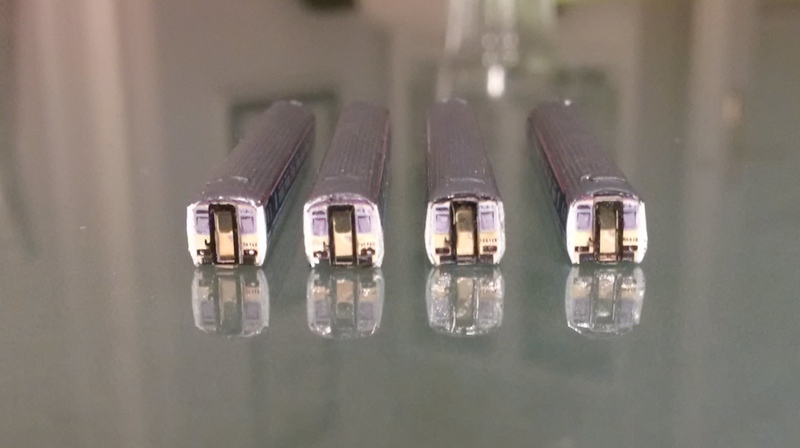 With your T gauge looking this good in close up they must look perfect in real life. Oh yes, most definitely absolutely stunning. today I found some minutes to put the cars on wheels. Still, "sub-floor" equipment is missing, resulting in a kind of high heel impression. Anyway, here we are. The transparent windows can be seen quite well. A number of the axles are quite wobbling. I will have to do some selection, I fear. Oh that's brilliant Kupzinger. I also like the fact that you've shown it starting from stop. I don't like videos that just show them going, no starts or stops. That doesn't really show the quality of the model and it's not as interesting to watch. Such a realistic start at such a small scale is amazing. You don't often see movement as good as that even in O gauge.